First, a few words of caution: this is something that is very much in the development stage. 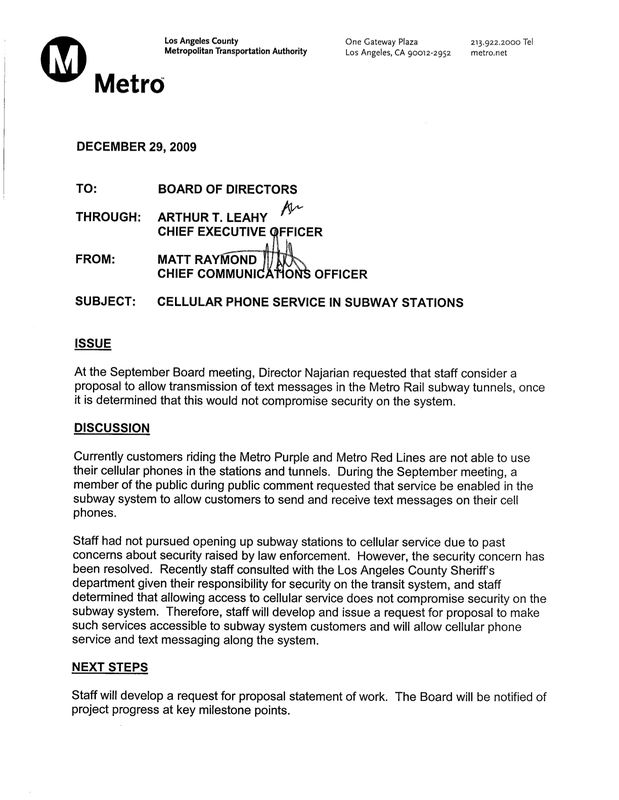 But it appears that Metro is going to move ahead and seriously begin exploring a way to provide cell phone service to subway passengers now that some security concerns have been addressed. BART customers who subscribe to the major mobile phone companies can now use their mobile phones and wireless hotspot devices to make calls or surf the web as they go under the bay between San Francisco and Oakland. Over the weekend Sprint, Verizon, AT&T and T-Mobile turned on their networks inside the Transbay Tube. In fact, BART passengers now have a continuous wireless access from the West Oakland BART Station all the way to Balboa Park. In the case of Metro, the first step is developing a request for proposal. That’s a document that can be sent to private firms that outlines what the agency is looking for in terms of cell phone service. The memo from Matthew Raymond, Metro’s chief communications officer, to the agency’s Board of Directors is posted after the jump.